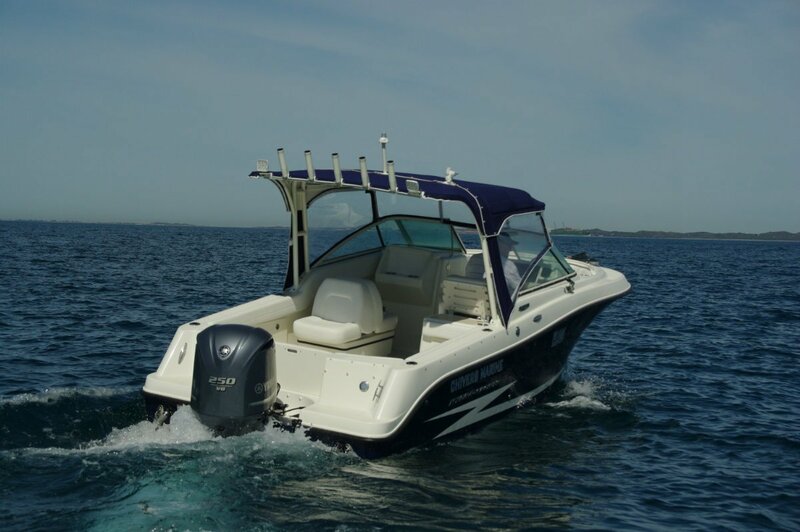 Where most imported bow riders fit in the day cruiser mould, the 2300 is a genuine all rounder: hauling a ski or tube, hosting a party or chasing fish are all in a day’s work, and all are catered for by the comprehensive fit-out. One of the keys to versatility is that toilet: there are a great many people who will not go afloat without one, and this leaves the usual chemical job in the shade. It is housed in the port console but is in no way cramped; Tardis-like it easily accommodates a flushing toilet, a wash basin, a thick stack of magazines and plenty of deck space. There are individual seats for eight and they are all beauties – the driver’s is an armchair with lifting bolster. Some boats overdo the seating, but the 2300’s layout leaves plenty of space in the main cockpit for fishing. To port there are back to back to back seats, providing an observer for skiing, and by pulling the right catch they slide out to form a daybed. The bow cockpit has three seats, with insulated bins beneath them, and good legroom. A clever piece of dual use allows the transom door to be removed and brought up here to form a table; solves the common table storage problem. Storage generally is no problem at all. 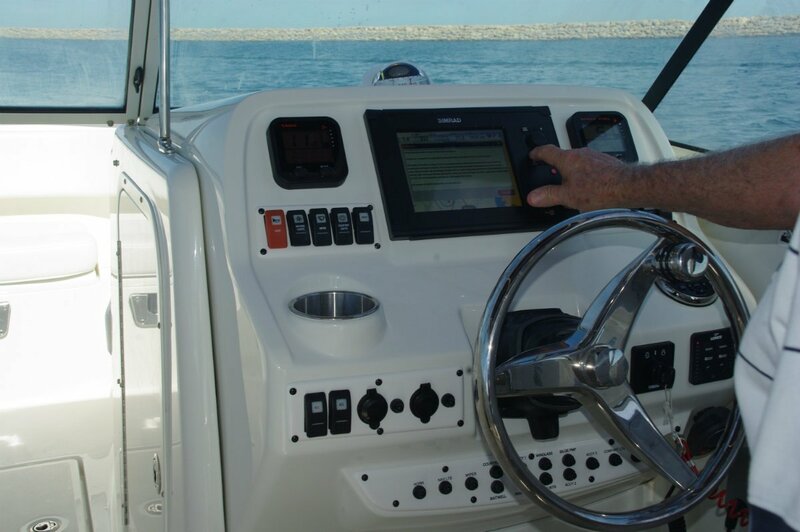 The starboard console holds as much as the average boat’s total, and the under deck bins even more. These will absorb skis, surf boards and scuba gear, and have dedicated racks for fishing rods. The moulding that houses the sink behind the driver’s seat has drawers, including a tackle drawer, hopper lockers open from the rear bulwarks, and if space runs out there is a further locker within the transom. Fishability is not just a cosmetic feature of the 2300; all the wanted features are here. Circulating bait tank, bait board, more rod holders on the Targa, deck wash, and high padded coamings. There is also enough stability to allow the rail to be packed with anglers with negligible list. 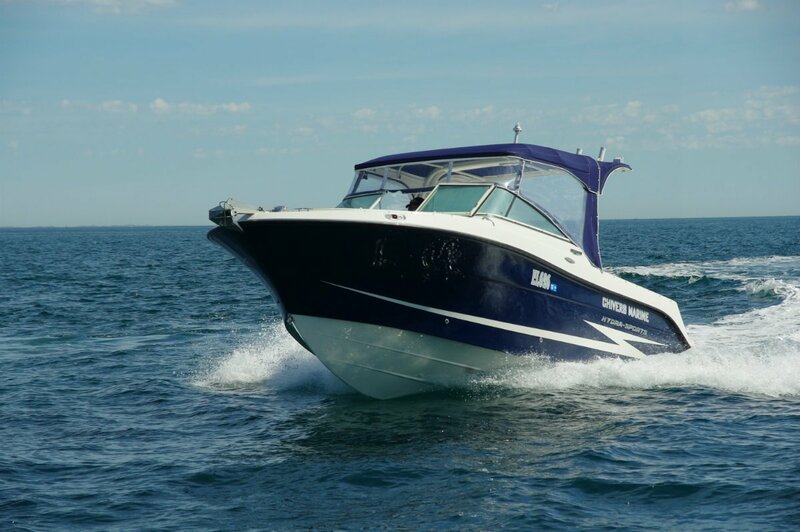 The importer of Hydra-Sports boats, Chivers Marine, has rigged the 2300 with the items Western Australians want and Americans apparently do not. USA-sourced boats generally have a naked bow, but this one now has a bowsprit backed up by a power windlass. And there is shade. A magnificent Bimini cantilevers forward from the massive Targa that also provides hand holds for standing passengers. Sitting, standing or perched on the bolster, an adjustable steering wheel ensures a comfortable stance for a driving position that gives good sightlines in all directions. The dash has plenty happening on it but still with room for any electronics you might wish to add. 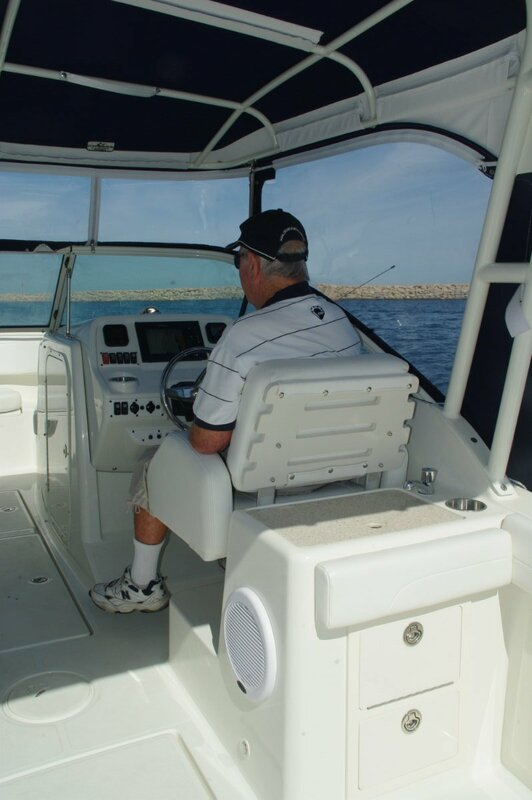 There could not be many of those with a Simrad sounder plotter already in place, and a high powered stereo system wired to speakers throughout the boat. 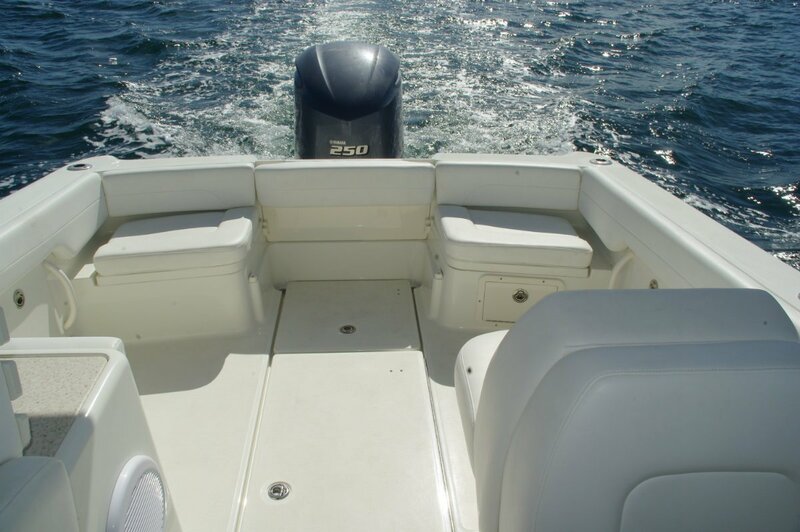 Our 2300 had the recommended 250hp, provided by the big block V6 Yamaha four-stroke. It was unquestionably adequate, taking this by no means lightweight boat to a trace under 40 knots in seconds. We had only a modest sea so were able to use the speed for decadent quantities of playing around. This boat provides a lot of fun, and despite the amount of equipment built in does it with the minimum of fuss: not a rattle or a groan. We had two accompanying boats so were able to organise wakes to give us some sizeable lumps to power over. The results were all good: the sharp entry and 20 degree deadrise provided soft landings, and the reverse chines threw the spray out absolutely flat. This should be a dry boat. There is something for all the family here. The 2300 would be equally at home fishing deep water, puttering up the river or anchored in Herring Bay.